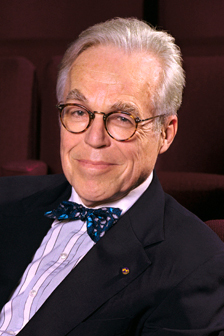 John Guare burst onto the national theatre scene in 1970 with The House of Blue Leaves: a kitchen-sink drama with “lots of songs and talking to the audience.” In 1971, Guare was asked by director Mel Shapiro to help with the text of Shakespeare’s The Two Gentlemen of Verona. 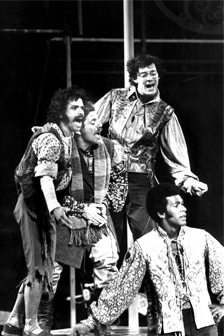 The project quickly transformed into a full-blown rock musical, with songs from Galt MacDermot, the composer of 1967’s Hair. The energetic Guare, whose House of Blue Leaves had its third Broadway run this April, spoke from his home in Manhattan. I love the way that Shakespeare does it. The only lesson—to me, the most important lesson of playwriting—is that the line has to contain everything. What I love about Shakespeare is that he writes his subtext. The subtext is always visible. He strangely demands clarity of thought. The beauty and density of the language can blind people to its meaning, but as Sir Peter Hall once said to me, you can find a declarative sentence in every speech that tells you what the sense of that particular moment is. And that’s why that John Barton book about understanding Shakespeare (Playing Shakespeare: An Actor’s Guide) is one of the most astonishing books about perceiving Shakespeare. It’s both the clarity and the shameless theatricality of it. I must always remember to write my play as if it is to be done on a bare stage and the line has to carry everything. That summer of 1971 had been a summer of great racial unrest. The summer before, they had sent Macbeth up to the streets around the boroughs. And when they got to 125th Street the actors were stoned—rocks were thrown at them. Two Gentlemen was also going to be designed for the flatbed truck, to go around the five boroughs. Mel said, if we bring these sentiments of courtly love up to the streets that are about to burst into flames, we’re going to be machine-gunned down. Since we had just worked on The House of Blue Leaves, Mel asked me if I could take the text of Two Gentlemen and shape it into a 90-minute entity. I didn’t feel any compunction about doing that, really. The play itself was freewheeling enough that it didn’t have the sacred textual holiness of Lear or Hamlet. It’s shot through with beautiful poetry, and a damn good, funny little story. 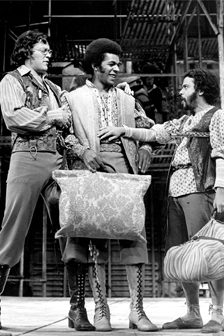 Photo of Raul Julia, Clifton Davis and Jose Perez by George Joseph, courtesy of the Public Theatre. The things that we had to strengthen were the real friendship between the two guys [Valentine and Proteus], to really establish the depth of their friendship… I know that we loved the two actors playing Speed and Launce, Jose Perez and Jerry Stiller, and so we wanted them to have a song. And they were outsiders, so I wrote the song “I Want to Be a Hot Lover,” which is a line from Shakespeare, a hot lover like the kids in the play. And “Love’s Revenge,” when Valentine falls in love, that was another phrase from Shakespeare, and that turned into a song. It was about amplifying and strengthening all the emotional connections in the play. We cast Raul Julia as Proteus, and then decided to have somebody from every neighborhood we were playing. It got to be this multi-ethnic, multi-racial cast. It was a thing of such joy, and the few songs ballooned to about 32 songs. And then the unbelievable happened: it got great reviews, and moved to Broadway where it ran for a couple of years and then had a long tour. So it was just one of those gifts that happens early in life, where it was written only in joy and cast in joy and performed with joy, and it was a wonderful time. The Shakespeare Theatre Company will be producing a musical concert of The Two Gentlemen of Verona (a rock opera), running January 27 to 29, 2012, concurrently with the mainstage production of Shakespeare’s text.